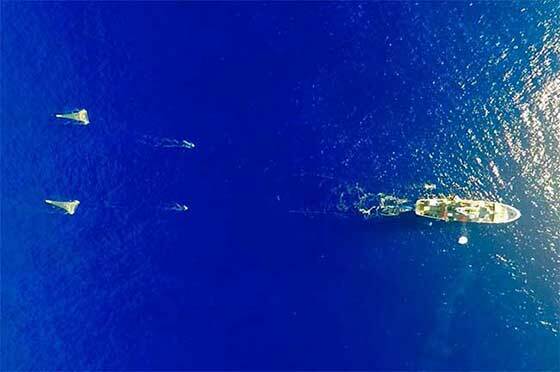 Scientists and volunteers at the Ocean Cleanup have concluded the so-called �Mega Expedition� aimed at accurately determining the amount of plastic garbage floating in the Great Pacific Garbage Patch, in preparation for the large-scale cleanup of the area set to begin in 2020. The first group of vessels including the fleet's 171ft mothership returned to the port of San Francisco on August 23, following a month-long voyage through the area. During this period of time, a fleet of close to 30 vessels sampled the concentration of plastic at the Great Pacific Garbage Patch using a series of measurement techniques, including trawls and aerial surveys. "I've studied plastic in all the world's oceans, but never seen any area as polluted as the Great Pacific Garbage Patch," said Dr. Julia Reisser, Lead Oceanographer at The Ocean Cleanup. "With every trawl we completed, thousands of miles from land, we just found lots and lots of plastic." Although the samples collected during the expedition still have to be analyzed, preliminary findings indicate a higher-than-expected volume of large plastic objects floating in the ocean. This underscores the urgency of The Ocean Cleanup's mission to clean it up, according to the Ocean Cleanup's CEO and founder Boyan Slat: "The vast majority of the plastic in the garbage patch is currently locked up in large pieces of debris, but UV light is breaking it down into much more dangerous microplastics, vastly increasing the amount of microplastics over the next few decades if we don't clean it up. It really is a ticking time bomb."